Cell homeostasis, growth and division are critically regulated by highly specialised multi-subunit protein complexes. The malfunction of these complexes is frequently implicated in diseases such as cancer. 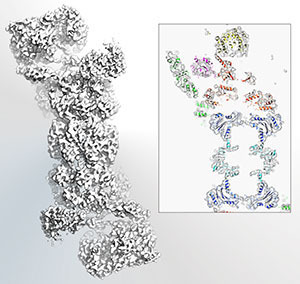 The full understanding of these macromolecular assemblies requires accurate structural information to define the interactions and functional mechanisms of their component subunits, and how these are integrated within the whole complex. Electron cryo-microscopy and single particle analysis are particularly well suited to address these issues. We harness the recent advances in these areas to determine high resolution structures of key protein complexes. 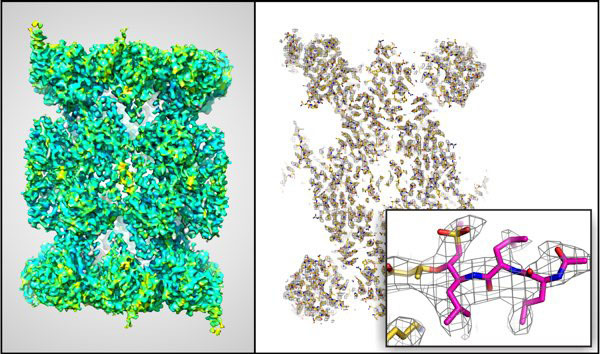 By combining structural information obtained in different functional states, together with further biochemical and/or biophysical data, we determine snap-shots of proteins in action that reveal their detailed functional mechanisms. Our work has been focusing on complexes involved in the ubiquitin/proteasome pathway, namely the 26S proteasome - an ATP dependent protease composed of at least 32 individual canonical subunits. These are arranged in two main sub-complexes: the 20S proteolytic core and the 19S regulatory particle, the latter comprising ubiquitin receptors, deubiquitinases, unfoldases/translocases and scaffolding subunits. The proteasome is an important target for the development of new therapeutic drugs against an increasing range of conditions. We aim at fully understanding its detailed mechanisms and regulation. Cryo-EM reveals the conformation of a substrate analogue in the human 20S proteasome core. Molecular model of the human 26S proteasome. Structures of APC/CCdh1 with substrates identify Cdh1 and Apc10 as the D-box co‑receptor.